Reports from my friends state that summer back home is officially over and that school is back in session. After volunteering in Nepali schools and a boys’ shelter last week, I can’t help comparing the education system here with the one I know from home. 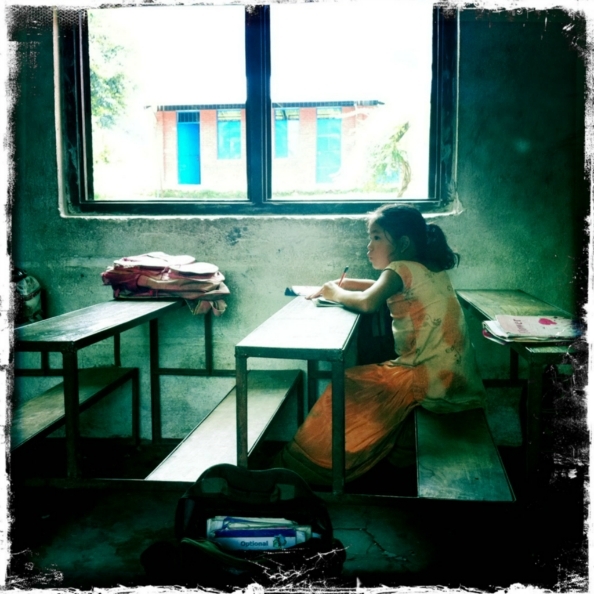 A school girl in Nepal studies during recess. I am envisioning my hometown with enormous back-to-school signage in primary colors hanging in many store entrances. An exciting buzz surrounds shopping for cooler weather clothes and collecting supplies, checking them off a list. When my brother and I were younger, we would excitedly hunt through the JCPenney catalog for a few new outfits and a pair of shoes. Later, at the store with Mom, we’d choose fancy lunch boxes, Lisa Frank and cartoon folders, and maybe a Trapper Keeper or Kaboodle to hold our new gel pens, mechanical pencils and glue sticks. Three-subject notebooks, neon-colored rulers, protractors and compasses were tossed into the cart to aid our education. In stark comparison, Nepali children need three basic supplies for school. These include notebooks where they transcribe what the teacher writes on the board, pencils for writing and a full school uniform, which is mandatory apparel. Some schools require their students to buy workbooks, but most do not even offer this luxury for learning. Before starting my first day of teaching, Jason and I chatted over tea with Nepal Volunteers Council’s president and director, Keshab and Manoj. Having worked in schools before founding the NVC, they told stories of children erasing their notebooks in order to refill them again. They warned us about the lack of government funds in the schools and spoke of their non-profit’s struggles in choosing who to sponsor from an endless pile of applications for school supply assistance. 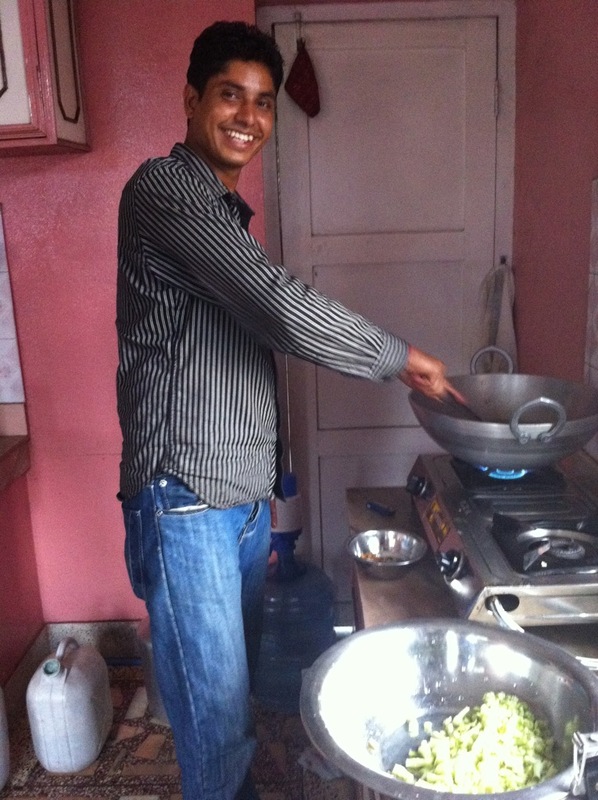 Nepal Volunteers Council Director, Manoj, cooks for volunteers. In the morning, I began at the host family’s rural home in the hills outside of Kathmandu. From here I meandered along a narrow footpath, teetering on a wall above flooded river fields, to reach Shree Maha Laxmi Lower Secondary School. “Hello, hello,” chirped tiny children, waving their hands vigorously. Entering the courtyard of the school, Dani, a volunteer from England, and I first noticed a skeleton of a swing set, rusty chain stubs dangling in the air. The actual swings had broken and were never replaced, but the students swung around the poles anyway, making us wonder if they had ever known what the structure was previously. School boys wait for teachers to arrive. A young girl in a uniform plucked flowers to take up time before class. She giggled and presented me with one. Seven or eight uniformed children crowded around us, practicing their English. We all waited for the school master and teachers to arrive and open the classrooms. We waited longer. And we waited. Finally Keshab called the school master an hour later. “Traffic,” Keshab announced when he ended the call. Shortly after the delayed arrival of the staff, a metal gong was struck by a teacher to begin the assembly. Children stretched and marched in unison in the grassy courtyard and filed by class into their appropriate rooms. When I walked into the seventh grade room, they stood quickly from their long benches, saying, “Hello, Miss.” They didn’t sit until I told them they could. The lesson plans throughout the week involved everything from sentence structure to proper hand washing and nutritious eating. Students’ favorite activity was playing hangman with new vocabulary words and reading poetry from a recently donated library book. When class would end, sometimes the students would want to stay longer to keep learning. Jason teaches orphans in their empty classroom at the boys' home. In the late afternoon, Jason finished his daily sessions at the medical clinic, and we would occasionally join the boy’s home volunteers. Near NVC’s hostel is a three-bedroom home donated by a local family to house 12- to 16-year-old orphans. 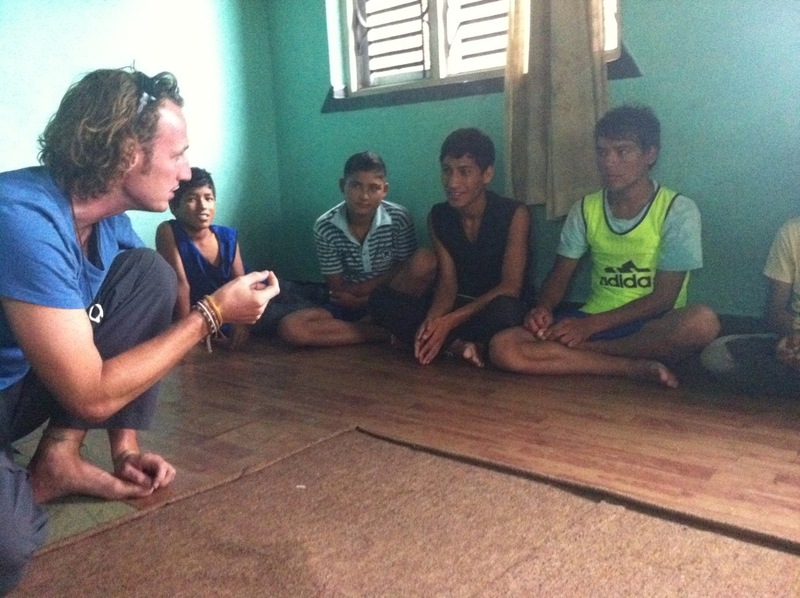 During the years of unrest here in Nepal, many of the parents of these boys were murdered. Some of the boys even saw this atrocity and were taken in by this orphanage, where they sleep 2-3 to a bed. Because they can not afford school, many of them do not attend class, so it was our job to help catch them up on English reading and vocabulary. Dani brought 1st grade level books and they boys adored reading 1 page each and passing them around. After teaching in the public school, the private school, and the boy’s home, we came to a conclusion: Nepali children realize what a privilege it is to be educated and they are pumped up to learn! Students hung on every word we spoke and were so eager to contribute to the class that they often didn’t remember the rule about raising hands to be called upon. In my experience, the kids treated learning more seriously than some of the teachers, and in a country with such a divide between rich and poor, I understand why. We were able to take part in this program due to generous wedding gifts that were specifically designated for teaching and volunteering internationally. We loved this cause and were so inspired by Keshab and Manoj’s tireless work that we have decided to start a Nepal notebook campaign through our new foundation, OnlyABuck™. For $1, you can help. After reviewing our website’s traffic numbers, we realized that if everyone who reads our blog pitches in just $1, we will have a collection to make our first order for school supplies. Supplies will be ordered directly through us to ensure 100% of donations are used for these school items. Nepal Volunteers Council will then distribute to those children who have applied to receive aid. We hope to dwindle the stack of applications that now sets on Manoj’s desk and give eager children a chance to learn. Sending a child to school for one year costs $140/ year. 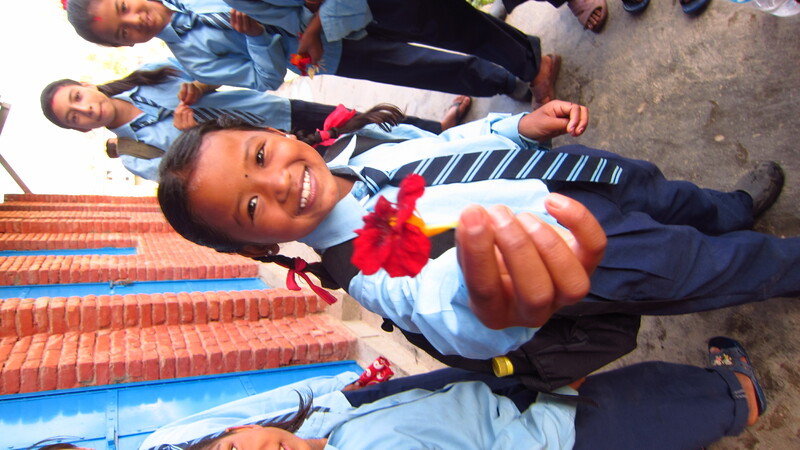 A school girls gifts me a flower. If you or members of your organization would like to donate to OnlyABuck™ for school supplies, please click the previous link or contact us for other options. We will update the number of students helped here on our site, so stay tuned! Thank you to the following people who contributed specifically to our education efforts around the globe. Your donations were used in volunteering in Nepal in addition to The Head Start Program in the Philippines. Many thanks to Dennis and Donna Payne, Rob and Mary van den Brand, Ron and Maggie Desbrough, Ryan van den Brand, & Terry and Kevin Olsen. Oh, and I am a very proud Father of a Groom and a very,very Proud Father in Law of a Bride. Keep up the good work. I Love you 2 SO MUCH. You guys are amazing. I am poud to be your friend!